With all the latest breaches in the headlines, protecting sensitive data is now critical for all types of organizations. Yet deployment of data protection like DLP often seems daunting on the surface. Learn how to achieve rapid benefits while setting yourself up for a long-term deployment with the simple "Quick Wins" process developed by industry thought-leader Rich Mogull and his team at Securosis. Organizations face a problem with the growing universe of digital information as it is considered to be business communications and must be preserved according to the same industry-specific regulations governing the retention and discovery of emails and more traditional forms of electronic communications. This poses a number of fundamental problems for organizations, their stakeholders, attorneys, IT professionals and compliance personnel as they try to balance the cost, burden and need for electronically stored information. and the role of DLP in the management of ESI, e-Discovery and data protection. Protecting data can be tricky. It has many different forms, resides in many different locations, is subject to an increasing number of regulations but most importantly, it changes constantly. 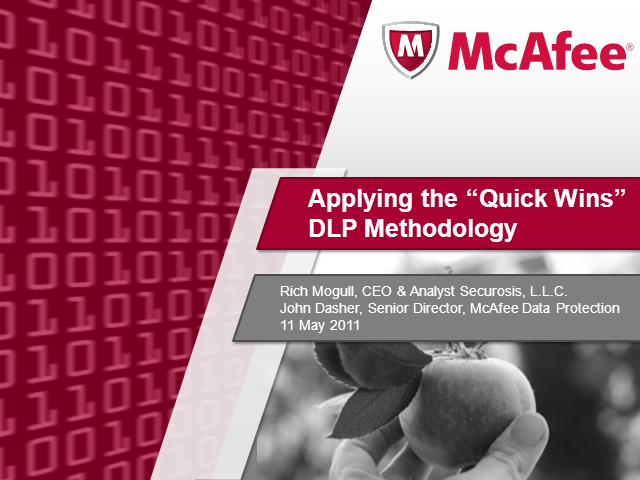 How can DLP solutions keep pace? Suffering from the "garbage in, garbage out" syndrome more than other security solutions, effective data protection places exacting requirements on IT. Join our data protection experts to hear their thoughts on how to make DLP solutions effective within this complex landscape. WikiLeaks has repeatedly published extremely confidential, classified U.S government documents obtained from U.S. government personnel who were not authorized to release the information. WikiLeaks is now threatening to disclose incriminating documents regarding a major U.S. bank. With the focus shifting to businesses, there is a new urgency to address information security within organizations. At risk are emails, documents, databases and internal websites that are critical to your business and your reputation. Routine security policies are usually insufficient should someone with legitimate access decide to go rogue. All that’s needed is intent, access to sensitive data, and a cheap thumb drive. Attend and learn how WikiLeaks happened; why it is relevant to your organization and easy steps that you can take to protect your sensitive information. In 2010, the emphasis on cost control in healthcare continues. The HITECH Act of 2009 incentivizes healthcare providers to move to electronic health records (EHR) systems but that comes with increased risk of data breaches. According to the Los Angeles Times, roughly 150 people (from doctors and nurses to technicians and billing clerks) have access to at least part of a patient's records during a hospitalization. Of the 385 organizations hit with data breaches so far this year, 113 were in healthcare! As regulations governing the handling of data get tougher, healthcare IT organizations must take action to protect devices and prevent data loss. Data Loss Prevention and encryption solutions help you deliver better healthcare while controlling costs. Attend and learn how you can pass audits with confidence; reduce the complexity and cost of protecting your data and create a safe environment for physicians to freely exchange information. Securing cardholder data is the cornerstone of complying with PCI DSS regulations. Protecting your customer's private data is also essential to protecting the reputation of your business and its brand. IT's role in achieving this goal is critical as the increasing complexity in multiple regulations creates a need for increasingly complex solutions. McAfee believes that a simple approach is better. Having the right tools reduces complexity and creates insight into real-world data use that has previously been hard to achieve. This webcast will discuss the best practices and technologies used by leading merchants to reduce the burden of achieving and sustaining PCI DSS compliance. The goal is to save you time and money by showing you how to appropriately apply solutions that offer the features you need to succeed. When used properly, Data Loss Prevention (DLP) provides rapid identification and assessment of data security issues not available with any other technology. However, when not optimized, two common criticisms of DLP are 1) its complexity and 2) the fear of false positives. Security professionals often worry that DLP is expensive and will fail to deliver the expected value. A little knowledge and some planning go a long way towards a fast, simple, and effective deployment. By taking some straightforward best practice steps, you can realize significant immediate value and security gains without negatively impacting your productivity or wasting valuable resources. You will also hear how Continuum Health Partners safeguards highly sensitive patient data with McAfee DLP 9. Join us for this informative presentation. Today, your data is constantly at risk of loss and exposure. The Internet itself, increasing numbers of easily lost or stolen mobile devices, and even insiders pose real threats. This channel will offer information around strong encryption, authentication, data loss prevention, and policy-driven security controls to help you prevent unauthorized access to your sensitive information.